Hey everybody! How are you today? How’s the family? Now that the small talk is out of the way, let’s get down to business. It’s Wednesday and it’s time for the latest and greatest Pick of the Week Podcast! We’ve got an exceptionally great podcast for you guys this week! You’re going to love it! 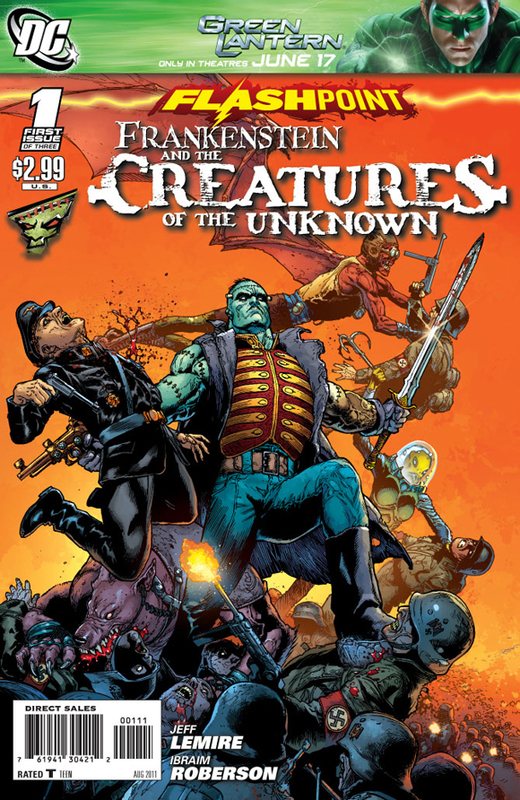 This week Simon had the pick and he had a hard time deciding which book to go with, but in the end he decided to go with Flashpoint: Frankenstein and the Creatures of the Unknown #1 from writer Jeff Lemire and artist Ibraim Roberson. There is a bit of sad news this week. Unfortunately, Ian had some very important business to take care of in Las Vegas (I like to call it “Lost Wages”) and was unable to join in this week. Luckily, we were able to bring in our good friend, Louie to fill in for Ian. So join Simon, Ken, and Louie for a fantastic POW Podcast where they also discuss: Booster Gold #45, Flashpoint: Citizen Cold #1, Flashpoint: Deathstroke and the Curse of the Ravager #1, Flashpoint: Emperor Aquaman #1, Fear Itself: Deadpool #1, Fear Itself: Spider-Man #2, Ghost Rider # 0.1, New Avengers #13, Ultimate Comics Spider-Man #159, and Screamland #1. In addition, the team also reveals the results for the latest Poll of Week. So, go on! Go listen! Music: Get to the Choppa.